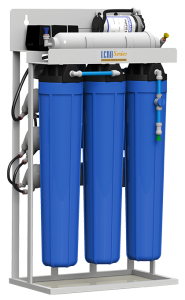 Although small application RO systems, units in the 200 to 400 gallon-per-day range, are not new, they are definitely gaining in popularity. 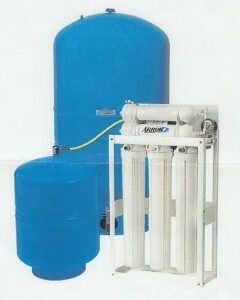 They are especially handy for small businesses that need a limited amount of high quality water. Although they are too small for most water vending or whole house applications, they work great for small private car wash or window washing applications, small restaurants that want great water for drinking, cooking, and making beverages, greenhouses, laboratories, coffee shops, company break rooms and cafeterias, etc. Most are multi-membrane units. Two to four small membranes running in parallel is standard. 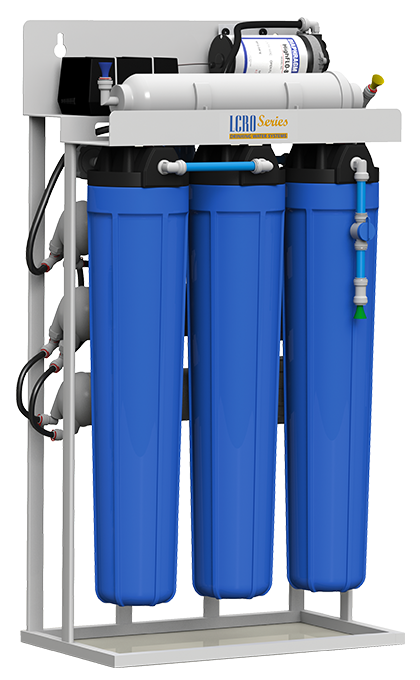 One company’s simple design advertizes two 100-gallon-per-day membranes for a 200 gpd unit, three membranes for 300 gpd, and five membranes for 500 gpd. This system works in theory but can be awkward in practice, especially when troubleshooting performance issues. A single, large membrane is probably a more practical arrangement. 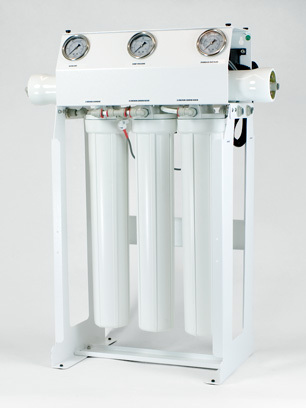 Most RO units in this class use at least two booster pumps to bump up water pressure to the membranes. This system works well, but can become an issue unless a single electronic shutoff system is used to start and stop the pumps together. When using small pumps on multiple membranes, the pumps usually put out less pressure than the theoretical expectation. Most use 2.5″ X 20″ filter housings (see all units pictured on this page), although standard 2.5″ X 10″ cartridges are offered as an option in a few systems. Standard cartridge arrangment is sediment, pre-carbon, and post-carbon, although a DI option for the postfilter is sometimes offered. Remineralizing cartridges are also getting popular. Standard in/out tubing is 3/8″, but 1/4″ is often used for interior connections. Some units come standard with pressurized storage tanks; some offer tanks as an option. Most small RO units in this class can be used either with a pressure tanks or an atmospheric tank. Most, but not all, come with such electronic control features as low pressure shutoff and high pressure shutoff. Some have electronic autoflush drainline flow restrictors. Other options include ledge faucets, mounting stands, TDS monitors, delivery (demand) pumps, and UV lamps. Depending on your needs, the best system may be the simplest. Most RO units in this class depend on multiple electrical control components and there is a lot that can go wrong. This 300 GPD unit uses a single membrane. Most systems in this category use multiple small membranes.